Arganology rediscovers an original formula based on argan and cotton oil created by the alchemists of the ancient Al-Andalus. A rediscovered natural beauty secret exclusive to Salerm Cosmetics that gives hair back its natural shine,soft feel and brilliance. Revitalizes and strengthens badly damaged hair. Velvety texture. Easily absorbed. Non-greasy. Natural argan oil: a natural source of vitamin E that neutralizes the action of free radicals. Provides the hair with vital fatty acids that nourish the hair’s lipid store. Adds shine. Natural cotton oil: rich in fatty acids omega 6 and 9 that leave hair manageable and silky to the touch. Gives hair a pleasantly velvet texture. Woody with a touch of incense and vanilla. 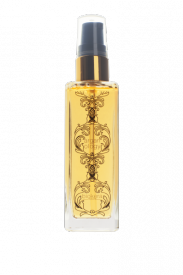 Place a few drops of Arganology in the palm of your hand and then smooth evenly over clean,damp hair. Style as usual.